Thank You for taking a look at my newest set of Modern quilting patterns. many repeats and rows as you need to fit your quilt. The two fan patterns should be set up in alternating rows and nested, as shown. Flat Spirals should also be set up in alternating rows. thought it was also interesting to flip every other row horizontally. The next six patterns are drawn to stitch across the quilt and back again. I used Modern Beach Fence in the gusset of my Portfolio. I think it would make a great Modern Border, too. are complex patterns that will run in a more traditional E2E style. Patterns drawn with lots of pebbles require nesting and the edges are rarely straight. I suggest finishing these types of edges with several echoes and then cropping those echo lines to fit the raw edge of the quilt. Photo above shows a detail of a cropped edge. 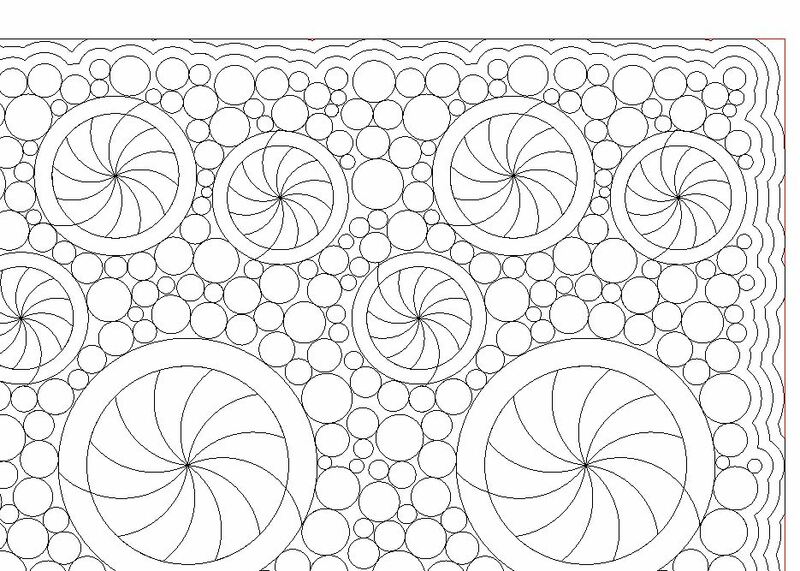 The single Peppermints pattern, as drawn, will look good on a small wall quilt. On a large bed quilt, I think the layout is better with the large peppermints toward the bottom. To achieve this effect, load the quilt horizontally with the bottom of the quilt to the left. The finished quilting will look like the sample here.